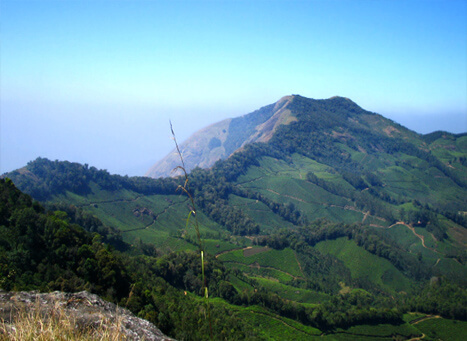 Facts Highest mountain in South India with hiking trails and encounters with wildlife such as elephants. Ticket Price "Indian Adults – 120/- (Children – 90/-) Foreign Nationals – 400/-"
Brief Lush, expansive park known for its nature trails, bird-watching & scenic lookout points. Extra The park is popular as a picnic spot and is home to tall trees and several rate flowering plant species. Brief Lofty overlook with a tea plantation, offering panoramas of the valley landscape below. Extra The lush green vegetation in the place with cardamom and tea plantations gives a rich aura to the place. Facts Pothamedu View Point provides a panoramic view of Munnar, adjoining valleys and Muthirapuzha River. Brief Scenic botanical garden with greenhouses full of rare flowers, succulents & other specimens. Extra In addition to the flowers on display, one can purchase saplings and authentic forest produces like honey, sandalwood, cardamom and lemongrass oil from the stall there. Brief Tourist attraction where guests can take short elephant rides down a path surrounded by trees. Extra The private park which is open all through the year offers you a different experience of riding an elephant. Extra Provides short term and long term treatments for different ailments. Facts The refreshing climatic conditions and tranquil surroundings of this place provide a perfect setting for this healing therapy to work effectively. Brief Speed boats, Pedal boat, row boat and motor boats are options available. Extra Speed boat and pedal boats can give a total different view of dam and surroundings. Address "Mattupetty Dam Munnar - top station highway, Mattupetty, Kerala 685616 1800 425 4747 https://maps.google.com/?cid=14852924847601627329"
Brief Mattupetty Lake is one of the most picturesque places for an adventurous boating trip. Facts Munnar is blessed with beautiful placid lakes and long winding rivers, thus providing ample opportunities for leisurely boat rides. People Love For Place During clear weather lake acts like a mirror for perfect reflection of the hills.